A “visual checklist” pinboard at my desk. Photo by the author. Picking paint colors. Stepping under ladders in closed off galleries. Artfully arranging teacups. All are things I’ve done in the past few weeks, and all are entirely fun perks to a curator’s job. Beyond the fun, what I aim to do in this post is go a little deeper into the process of installing, painting, and arranging an exhibition. 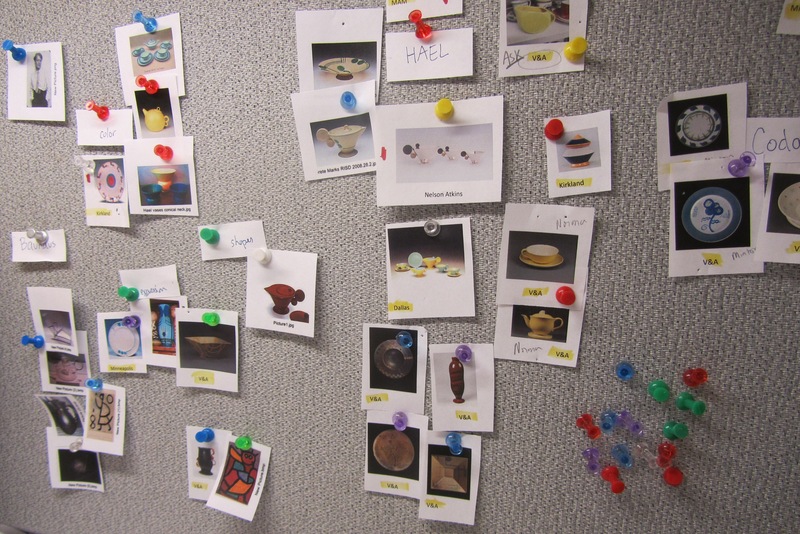 In the first three posts of this series, I’ve addressed steps to developing the Milwaukee Art Museum’s Grete Marks: When Modern Was Degenerate exhibition (on view September 6, 2012 – January 1, 2013), from idea to loan paperwork to marketing. The next step of bringing this incredible story and artwork physically to the public were the conversations we had about the design of the gallery, because there are as many ways to display artwork as there are paint colors in the Sherwin-Williams sample book. I know different galleries and museums and curators go through this process differently, but I was fortunate to be working very collaboratively with fantastic colleagues at the Museum and at the Chipstone Foundation. Working with exhibition designer Mike Mikulay, the Museum’s William Rudolph and I met together with Chipstone’s Jon Prown and Claudia Mooney. 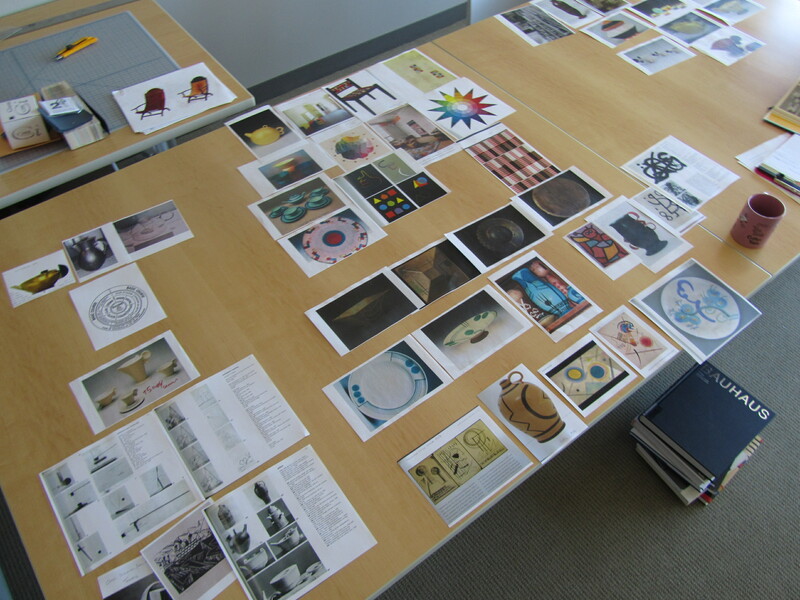 In several afternoon “think tank” sessions over the summer, we sat around a table literally strewn with images of the Grete Marks artworks that would soon be shipping to Milwaukee. Our work table for discussing label themes and arrangement. There are photos of the objects on the checklist, but also other comparative material. Photo by the author. In preparing for both writing the labels of the exhibition and the layout and design of the show, we talked and reviewed photos (shown above). The checklist of artworks we were borrowing was already set based on object availability and budgetary constrictions with an eye toward covering most parts of the artist’s output at the Haël Factory. But once we had all these pieces in our hands, how would they come together at the Museum? That’s what these meetings were all about. We looked for visual connections. We discussed the “big ideas” of the show, and which to emphasize. We mixed in other Bauhaus artworks, and photographs, to contemplate secondary material we might use. Did we think it made more sense for a visitor to move through the exhibition chronologically? Or should the artworks be grouped thematically? How much would we present about the artist’s education at the Bauhaus? How much would we say about Grete’s later career in oil painting in England? How much of a role would the Nazi campaign against “degenerate art” play in the space? 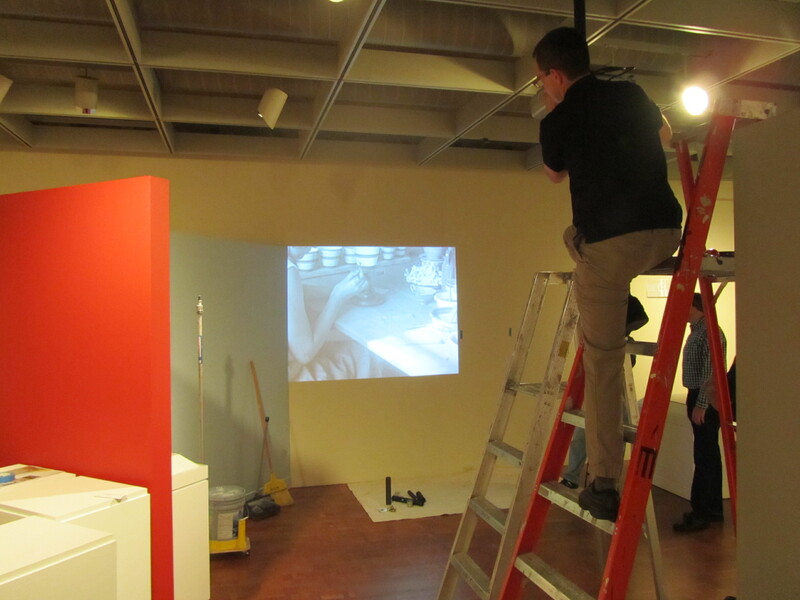 Mid-installation photo. Two photo reproductions used as supportive materials are leaned against the wall. 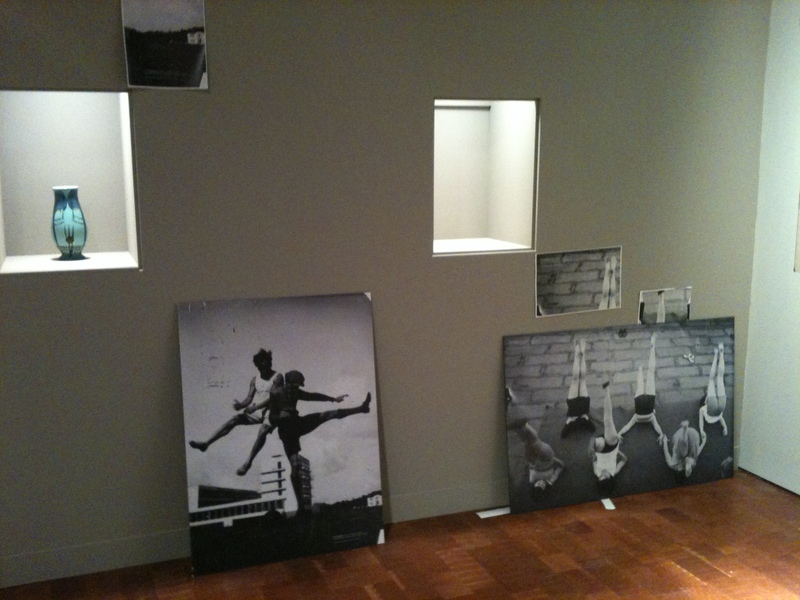 With two framed artworks and an additional vase, the entire wall will make a composition showing the “expressive” nature of Bauhaus training. Photo by the author. During this process, we decided together to green-light the inclusion of a small section at the beginning of the show introducing the Bauhaus educational experience. Looking at Grete’s designs strewn on the table, it became clear that even though Grete only studied at the school for one year, she applied the teachings in very direct way. We saw Bauhaus color theory, form studies, and expressiveness emerge from our groupings, and those became three sub-sections of the exhibition. These discussions led us to the flow of the space. We have an introduction about the Bauhaus, a section examining the Bauhaus influence on her work, a section showing Grete as a successful designer and entrepreneur with the Haël Workshop, a section on the Nazi persecution of “degenerate art”, and then the continuation of Grete’s career in England. Printed mock-ups of the wall labels for the Grete Marks exhibition. Photo by the author. Knowing how the story would unfold physically meant I could start writing label copy to provide the details, context, and thesis appropriately. I spent one weekend with lattes and The Black Keys writing the wall panels, and then shared my draft with colleagues at the Museum and Chipstone. Edits and suggestions were incorporated, we cut out about 30% of the text, and then a final draft went to the Museum’s editor. With her final edits in place, the text was handed over to the exhibition designer Mike Mikulay. He formatted them with the sizes, fonts, and colors matching the look of the show. 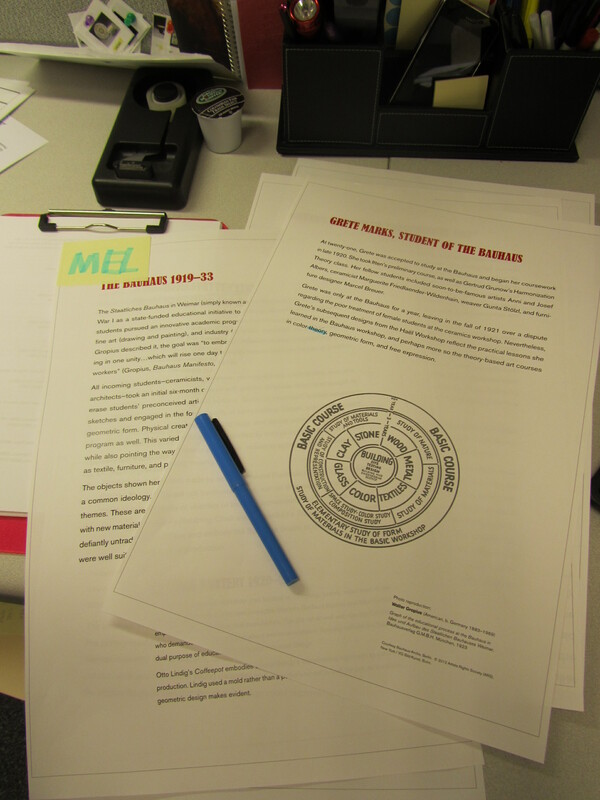 I had one more chance to review the text in to-scale mock-ups (shown at right), before the files went to the printer. Mike Mikulay came up with a beautiful exhibition design solution where you move from factory section to a black walled section (“degenerate art”) with a sharp diagonal line piercing the space, and an ominous quote about the artistic judgement of the Führer. But you then turn to a lighter blue section, where you see Grete’s continued career in England. Picking paint colors also happened sometime during all this discussion. Mike, the designer, turned to a stack of Bauhaus books for inspiration, looking at period display technique and color palettes. We encountered several examples of paint schemes that created overlapping and intersecting planes of various neutrals (cream, gray, light blue, white), accented with pops of red and black. 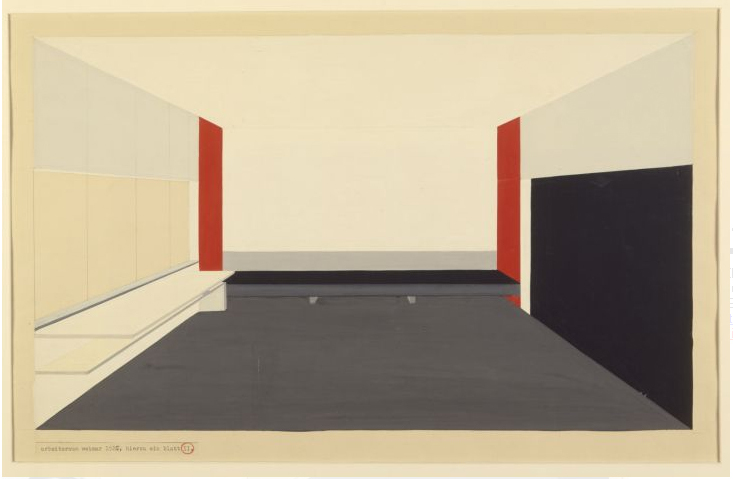 This is mostly clearly shown in the photo below, which was designer Peter Keler’s paint scheme for photographer László Moholy‑Nagy’s studio at the Bauhaus. Peter Keler, Design for the Moholy-Nagy Atelier, Sheet 1, 1924. 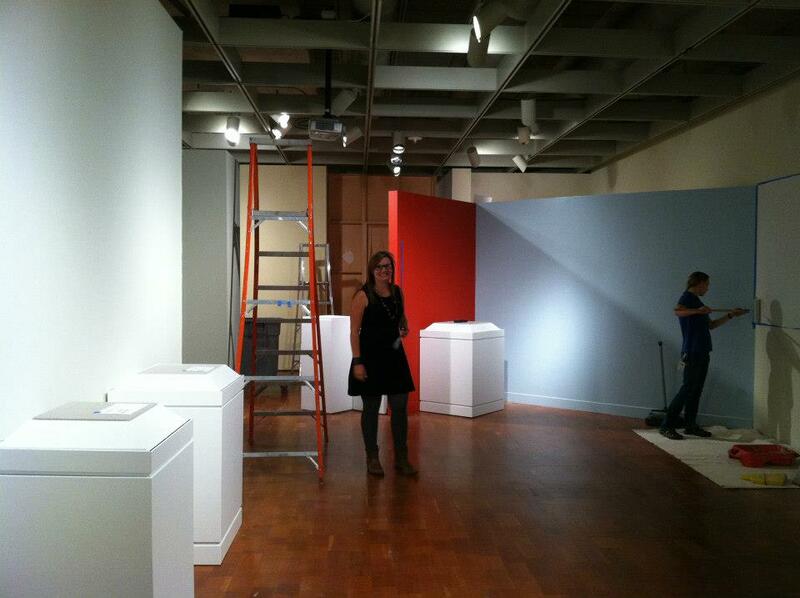 Mid-installation of “Grete Marks: When Modern was Degenerate”. Photo by Kristin Settle. The Bauhaus itself had several exhibitions of its work. 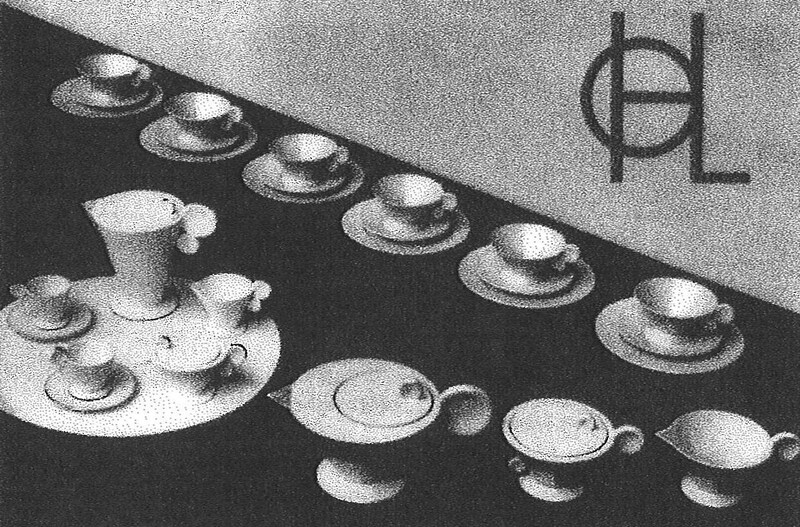 The chaise lounge we display on a diagonal platform was from a Bauhaus exhibition, and we had fun matching a few tea service arrangements to be like Grete’s own promotional material at the Bauhaus. Hael Workshop promotional materials, ca. 1930. And below is a mid-installation image of our arrangement of a tea service in the Milwaukee Art Museum’s collection (aqua) and the same pattern that we have on loan from the collection at the Dallas Museum of Art (yellow and aqua). 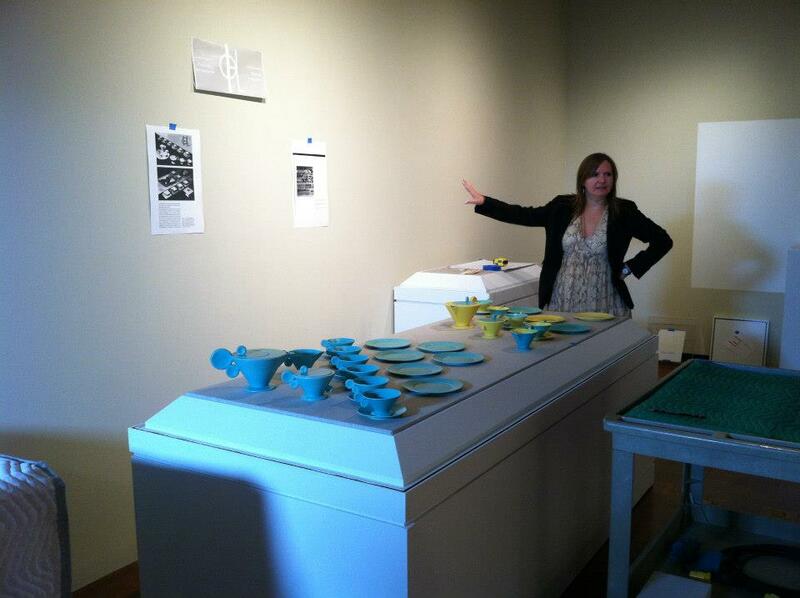 Mid-installation photo showing me discuss with Mike Mikulay the tea service arrangement in Grete Marks. We made modifications after this photo was taken. Photo by Kristin Settle. The photos below record some of the steps along the way toward installation design, in no particular order. 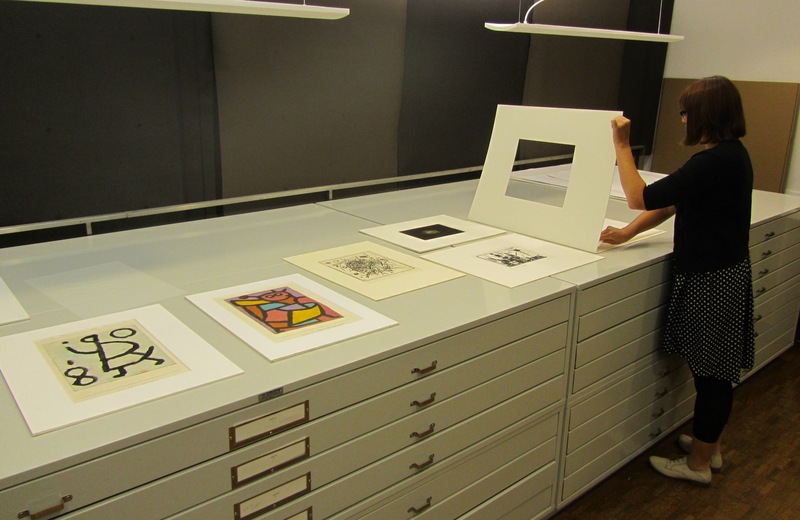 Tina Schinabeck sharing works on paper with the exhibition designer and me. Photo by the author. 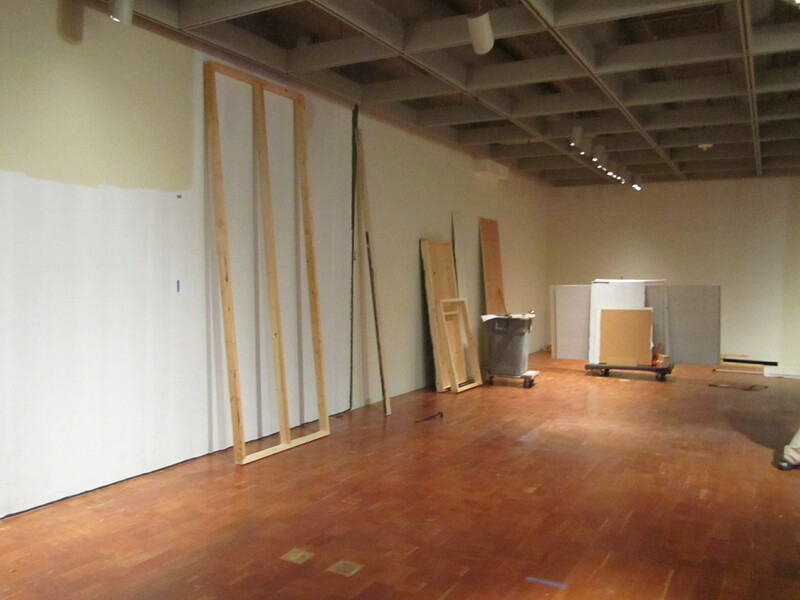 Below is an image of the Museum’s Decorative Arts Gallery in its “raw” state. The art installation team first removes the artwork from the previous exhibition, which meant de-installing Face Jugs: Art and Ritual in 19th-Century South Carolina and preparing it for travel to the Columbia Museum of Art in South Carolina. They then arrange and build the walls to the new show’s orientation, as well as spackle and prepare the walls for painting. The Museum’s Decorative Arts gallery emptied of artwork. Photo by the author. The Museum’s A/V tech Ted Brusubardis installs video equipment. Photo by the author. Next time, we’ll look at everything that happens surrounding the opening of the exhibition. The exhibition was organized with the cooperation of the artist’s daughter, Dr. Frances Marks, and is supported by the Chipstone Foundation, the Mae E. Demmer Charitable Trust, and The Collectors’ Corner. This entry was posted in Art, Behind the Scenes, Curatorial, Exhibitions and tagged Behind the Scenes, curator, exhibition design, Grete Marks, loans, paint. Bookmark the permalink.